CESAR® HOME DELIGHTSTM Beef Stew is formulated to meet the Nutritional levels established by the AAFCO Dog Food Nutrient Profiles for maintenance. 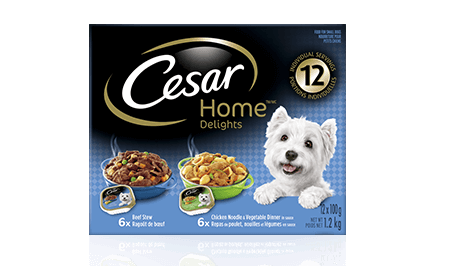 CESAR® HOME DELIGHTSTM Chicken, Noodle and Vegetables Dinner in Sauce is formulated to meet the Nutritional levels established by the AAFCO Dog Food Nutrient Profiles for maintenance. Beef Stew: CHICKEN, BEEF, LIVER, MEAT BY-PRODUCT, POTATOES, STARCH, WHEAT GLUTEN, MINERALS, CARROTS, PEAS, PEA FIBRE, SALT, WHEAT FLOUR, SODIUM TRIPOLYPHOSPHATE, VITAMINS, COLOUR, NATURAL FLAVOUR, XANTHAN GUM, GUAR GUM, SUFFICIENT WATER FOR PROCESSING. Chicken, Noodle & Vegetable: CHICKEN, LIVER, PASTA, MEAT BY-PRODUCT, WHEAT GLUTEN, STARCH, WHEAT FLOUR, CARROTS, GREEN BEANS, PEA FIBRE, MINERALS, SALT, NATURAL FLAVOUR, SODIUM TRIPOLYPHOSPHATE, VITAMINS, COLOUR, XANTHAN GUM, GUAR GUM, SODIUM NITRITE (FOR COLOUR RETENTION), SUFFICIENT WATER FOR PROCESSING.